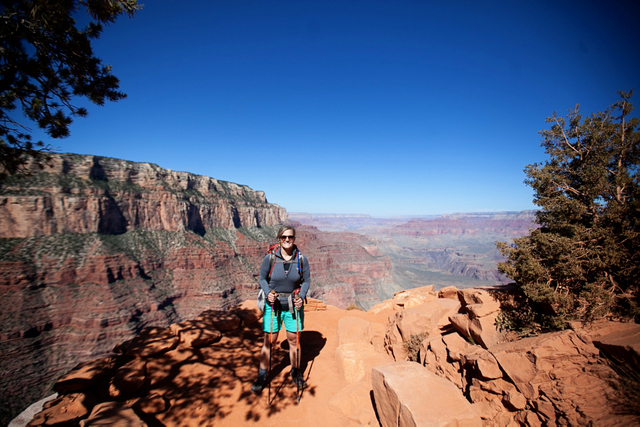 In honor of her birthday, and in honor of the great outdoors, today I’m interviewing my dear friend Holly about her recent trip to the Grand Canyon. Before we start, I want to tell you a little bit about Holly. She is quick-witted, self sufficient, and fun . We met while working on Capitol Hill in DC and I learned quickly that if I were ever stranded on a deserted island, Holly is one of the people I would want there. With Holly on this deserted island, I know we would have food, shelter, and water. She would figure out some clever way to make it all happen. Thank you, Holly, for granting me this exclusive interview. 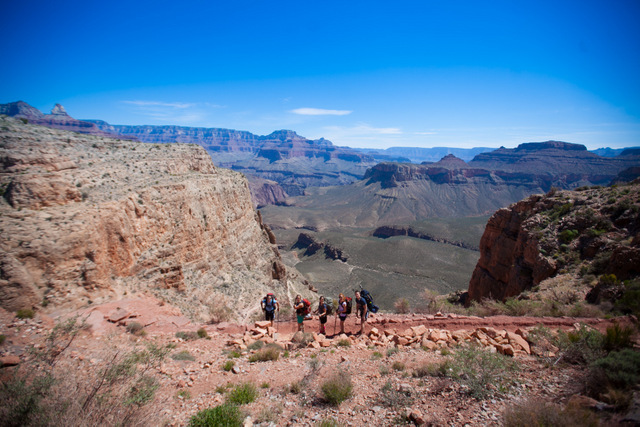 I am dying to hear ALL about your trip to the Grand Canyon! Let’s start with your itinerary. What did you do each day? 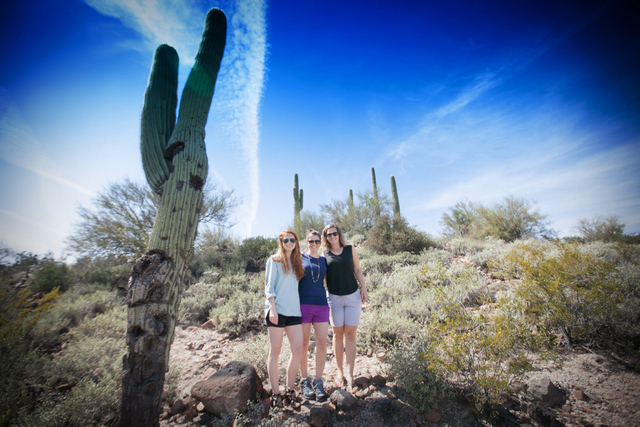 My friends from all over (DC, Houston, Indianapolis) and I flew into Phoenix. 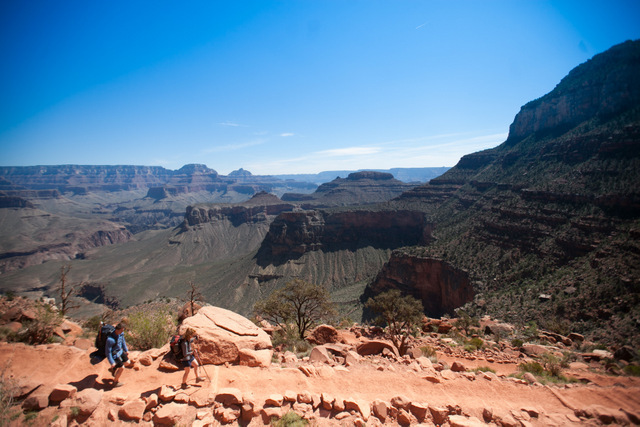 We stopped by REI to pick up items that we couldn’t fly with and then took off to Grand Canyon National Park. Note to readers: REI rents gear out and it is a great way to quickly and inexpensively get equipped for adventures like this. 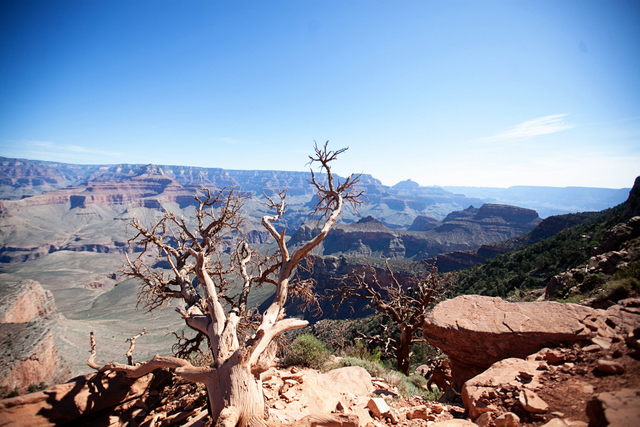 We checked into the Bright Angel lodge at the south rim of the Grand Canyon. It had stunning views and we made it just in time for sunset. Holly, you look like a walking advertisement for hiking. 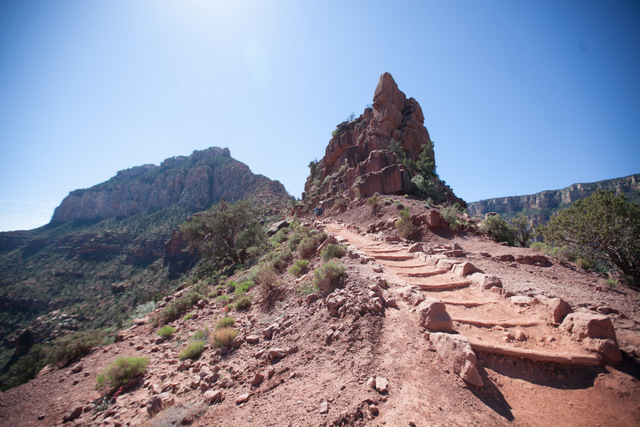 On this day, we woke up early for breakfast at the lodge and took off around 9 am for the South Kaibab Trail, roughly 7 miles long and all downhill. I got my hiking poles! I’m ready to go! 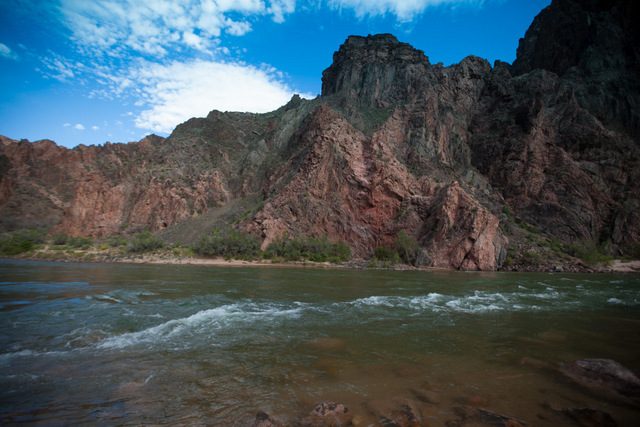 We arrived at the bottom of the trail around 2 pm, checked into our campsite and then relaxed on the Colorado riverside. We went to bed shortly after nightfall. Awoke early and watched the sunrise as we left our campsite. 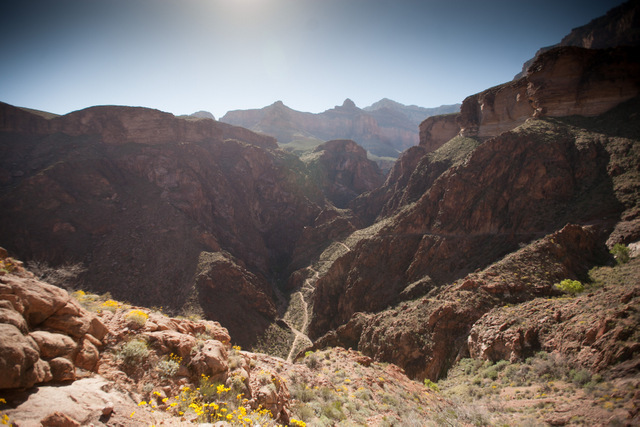 Took off on our 9.9 mile hike up the Bright Angel Trail. We made it to the top around 2 pm then took off to go back to Phoenix. We stopped at Cracker Barrel on the way home for some much needed country cooking. Arrived back at our resort and went straight to the jacuzzis. Which day was your favorite? I loved Sunday. It was Easter. We ate peeps on the trail. The trail, although longer and uphill, was so beautiful and scenic. You ate people on the trail? No, Whitney, we ate “peeps”, marshmellow bunnies. 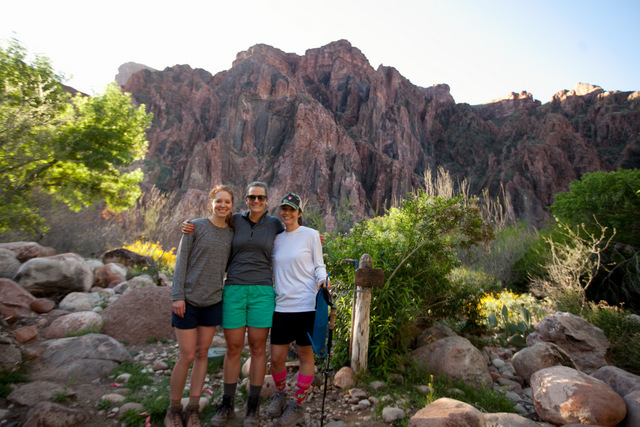 And, there is nothing like the feeling of conquering a multi-day hike and looking out over the canyon at all the switch backs and knowing you did it alongside great friends. Awwwwww! That’s so sweet! Why wasn’t I invited? Where did you stay? Did you like it? How did it compare to a hotel? On Friday, we stayed at Bright Angel Lodge in the national park. It was a beautiful lodge, with a tasty and inexpensive restaurant and beautiful look out spots. The rooms were surprisingly nice and clean and it was relatively cheap, especially considering the proximity to the trails. Holly chillin’ in her flip flops. 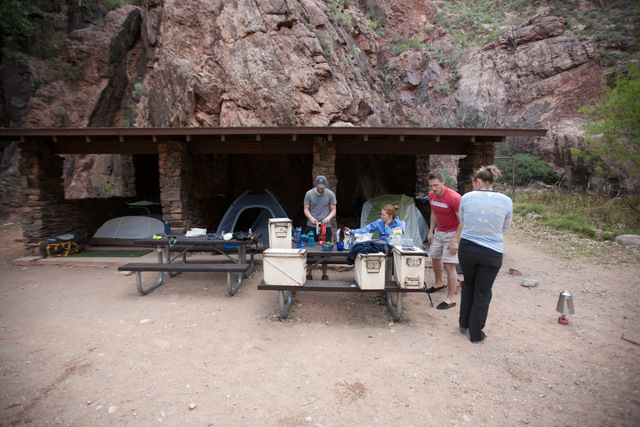 On Saturday, we stayed at Bright Angel camp ground at the base of the canyon. 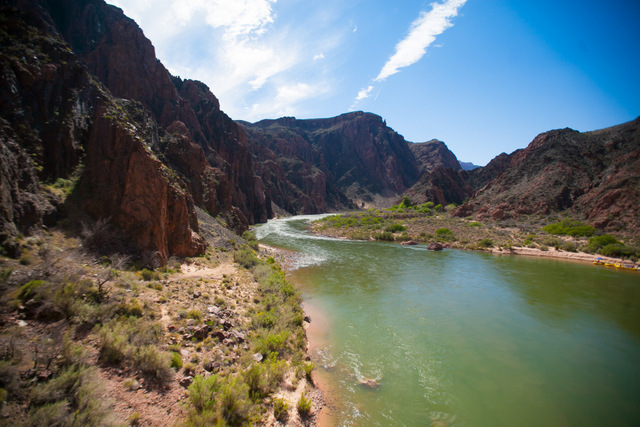 It was incredible and nestled right around the Colorado river. Thankfully, there were bathrooms there and running water so we didn’t have to use chlorine tablets for drinking water. One catch was that all the trash you hike in, you have to hike out so that was tricky but was easy enough. They give you a huge box to lock any sort of food to keep bugs/wild animals away. What did you bring to eat? We brought MREs to eat that night and had a fun time on the river during the day. I bet the stars were amazing. The stars were bright and you could pick out any constellation. We went to sleep with the noise of the river rushing. Did you reserve the campsite on the park website? Yep we had to apply months in advance. You could take the chance that they may have a site open upon arrival, but that was too risky. We were told its usually full Spring through Summer. What was the most helpful piece of equipment you brought? Probably my Camelbak, because it was much more convenient to drink water from the straw than taking my pack off every time. The second most helpful was hiking poles. We rented hiking poles not knowing what to expect but on the way up they were incredibly helpful. You can rent them several places in the national park. 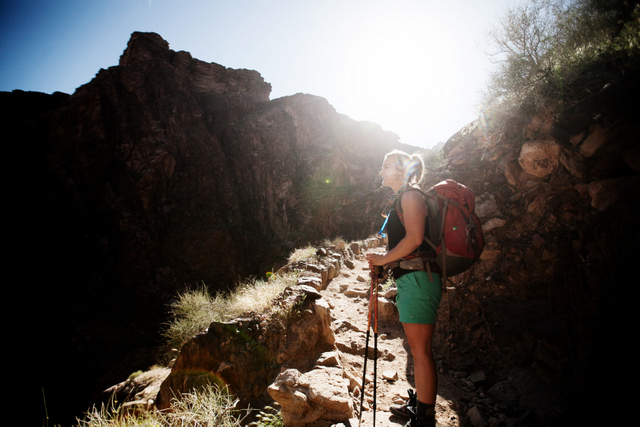 Hiking poles: an essential accessory indeed. Let’s go back to the stars for a second. Can you tell us more? Literally no words to describe how vast the sky is inside the canyon. The stars light up the sky and you can see any constellation. Any must-see’s in the park? The trails are beautiful. Every corner you turn, you see an even better view. 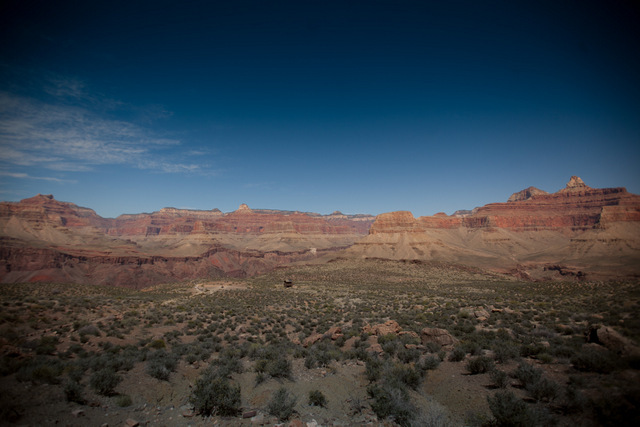 Based on the time of day, the colors in the canyon change and create such a gorgeous backdrop. Did your friends have a good time? Life is much better with community, and we loved going on this adventure together. It was a great excuse to get together and explore a place that most of us had never been. Amen, life is much better when shared with friends! Is there anything you would do differently if you were to go back? I would have done a few hikes in my hiking boots before wearing them on the trails. I got severe bruising on my ankles from the weight of my pack. 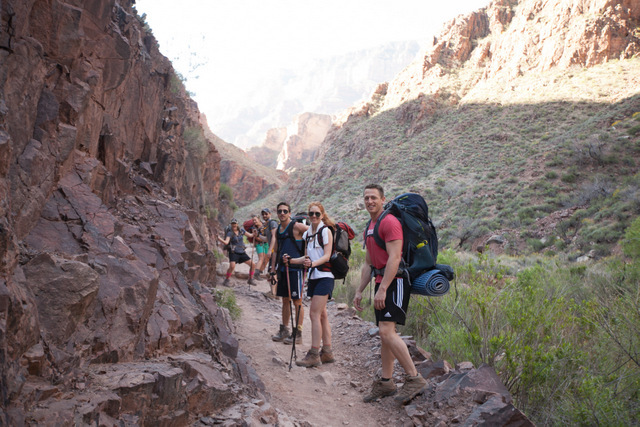 I would do a lighter pack or pay for a mule to take my pack down the mountain in order to really enjoy the hike. This is GREAT advice! Preach, sister! 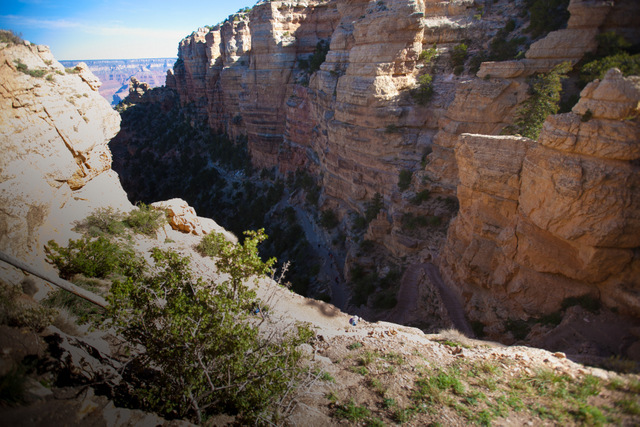 How does the Grand Canyon compare to other parks you’ve been to? GC really takes the cake. The only other place that compares, in terms of beauty and depth, is Shenandoah National Park in Virginia. I second that–Shenandoah is incredible, especially in Autumn. Anything else you want to let my readers know? Another surprising thing was the weather: it was chilly at the top of the canyon. (30s/40s at night.) But, down in the canyon, the weather was in the 80s. 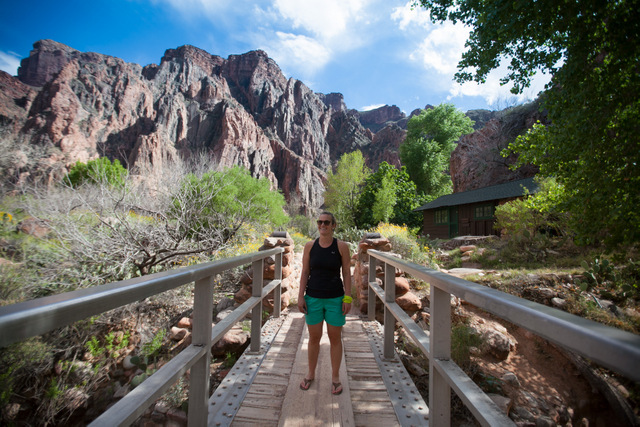 Thanks Holly for divulging all of your must-sees and secrets about the Grand Canyon. We appreciate it! 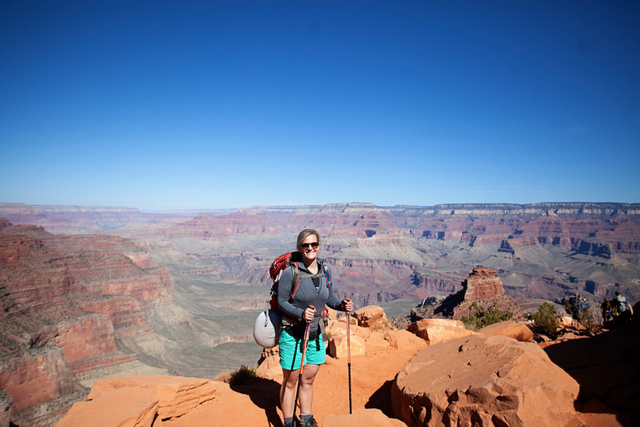 May Holly Johnson be your inspiration on your next Grand Canyon trip. Readers, if you have any questions for Holly, leave them in the comments. Photo cred goes to Holly’s friend Prashant, @photogp2013 on Instagram. No Replies to "Holly Reports on Her Grand Canyon Adventure"